To start, you need to have an audio file. There are a few main ways you can get or make an audio file. For example, my audio files come from my church, where I preach once a month. They record me through the sound board. If you can have someone else record you, that’s of course the simplest. They give me the mp3, and I’m set to go to the next step. But you may not speak in a public, recorded venue. If you are a beginner like me, you might only want to spring for something like the $100 Blue Yeti microphone (you don’t need the pop filter, but you do need headphones, so if you don’t already have some, get some). If you want to go a little cheaper, you can always get the less versatile but very capable and compact Blue Snowball, also a good choice. Trust me on this, however, YOU DO need a good mic. Using your headset or webcam mike is for chumps. The sound is 100 times better on a real mic. Oh, and why is the Yeti still an amateur’s mic? Because it doesn’t have any vibration isolation. If you want to go to the next step short of pro, you can spend between $600 and $1000 on something like a Heil PR-40 setup. 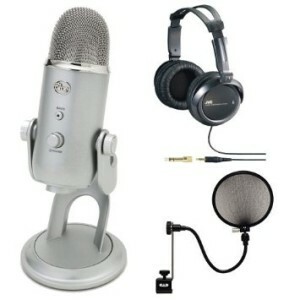 For more on a range of good podcast mics, check out The Complete List of Audio Gear You’ll Need for Your Podcast. OK, I admit that I am working on a PC, and there are probably a whole lot of cool audio editors for the Mac. But one of the most used and FREE audio editors out there, on both Mac and PC, is Audacity. Just get it. It’s MORE than adequate, and very easy to learn. NOTE: In order to export to mp3, you will need to install one other piece of software in addition to Audacity – the LAME mp3 encoder – there’s a link to it on the same Audacity download page. If you are recording more than yourself, you won’t use Audacity for recording (only for editing later). The best way to record an interview is using a combination of Skype and Pamela. Just download and install Skype. It’s free. 1. It launches Skype for you, and automatically starts and stops recording when you start or end a call. 2. It records your audio in one channel (LEFT), and your interviewee in the other (RIGHT). This allows you to clean them up independently. You can buy it outright for $37, or if you click the “Get it free” link, you can buy, for example, a $5 game from one of their partners and get Pamela for free. I did that, worked nicely. Many video and audio podcasts, like one of my favorites, the Verge Mobile podcast, use the recording capability built into Google Hangouts. I haven’t used this yet. The advantage is, you don’t need any recording software other than Hangouts, and you can have a bunch of people talking in a roundtable fashion. Also, recording video is fun and easy with Hangouts. The downside is, you won’t have independent audio files to edit, but for most roundtables, that’s not really doable anyway. Now, you are ready to record. After recording? Cleaning up your audio.